Idiogrid (Version 2.4) is software for administering, managing, and analyzing different types of self-report data. 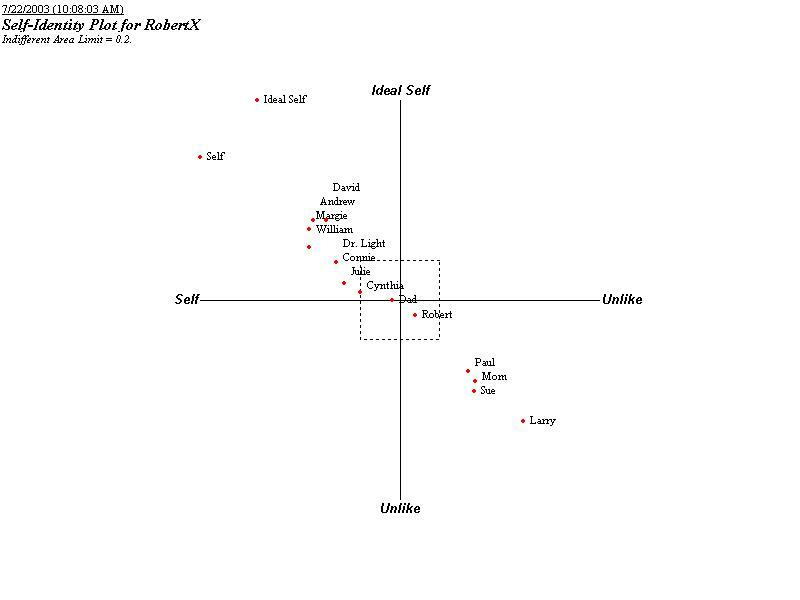 It was originally designed around George Kelly's repertory grid technique but has been developed to include person-centered and questionnaire methodologies employed by researchers from a wide variety of domains (e.g., personality psychologists, self-concept researchers, clinical psychologists, market researchers, and sociologists). Idiogrid is currently in use by hundreds of clinical psychologists, psychological researchers, and marketing/business consultants in dozens of countries from around the world. Questionnaire items can be written by the user and administered to clients or research participants in Idiogrid. The user can write the item stems, design the rating scale (e.g., Likert-type, simple rating, ranking), and modify various aspects of the item administration procedures. Questionnaire items that are in the public domain, such as those found in the International Personality Item Pool, can also be administered in Idiogrid. Data collected from different individuals can easily be combined, manipulated, analyzed, copied to spreadsheet programs, or exported to SAS or SPSS for further analysis. 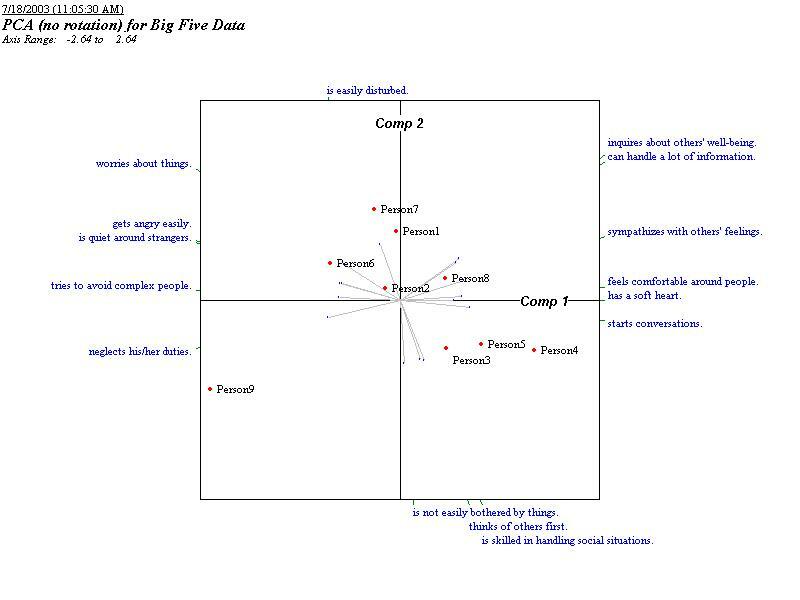 Click the images to the right to see example data from nine individuals who rated themselves on markers of the Big Five personality constructs, and the results of a principal components analysis of the same data. A unique feature of Idiogrid is that, unlike typical paper-and-pencil questionnaires, the user can ask each individual completing the questionnaire to rate other people or different selves (e.g., the ideal, ought, or future selves) on the items. In this way, within-person (idiographic) data can be collected and analyzed. Idiogrid allows the user to design and administer a wide variety of repertory grids. For instance, triadic, dyadic, or monadic construct elicitation methods can be used, rating or ranking scales can be employed, and role titles or actual names can serve as the elements. The user can also alter the appearance of the rating scale as well as its properties (e.g., number of scale points) and edit the instructions that accompany the various stages of grid administration. Click the images to the right to see an example completed grid and a self-identity plot. Bipolar adjectives (e.g., "True - False", "Light - Dark") or semantic differential types of items that are in the public domain can be conveniently administered in Idiogrid in a standardized fashion. The user can design various aspects of the rating scale (e.g., change the number of scale points or switch to a ranking scale), modify the instructions that accompany the rating procedure, and have individuals rate themselves, products, companies, etc. on the scales. Click the images to the right to view an individuals’ set of rankings regarding several automobiles she test drove and was interested in purchasing. With only a few instructions, students can sit down at the computer and complete a questionnaire or repertory grid. The instructor can design the procedures him/herself or use one of two automated repertory grid administration routines in Idiogrid. The automated routines faithfully reproduce the grid procedure as originally described in Kelly’s the Psychology of Personal Constructs. Click the images to the right to view several screen snapshots of the automated grid administration process. Once the questionnaire or grid is completed, the student can again follow simple instructions to analyze his or her responses and interpret the results as part of a class project. Students can also design and administer their own self-report questionnaires on virtually any topic. The students can write the questions, the administration instructions, and design the rating/ranking scale. They can then collect, merge, and analyze data from their questionnaire using Idiogrid. 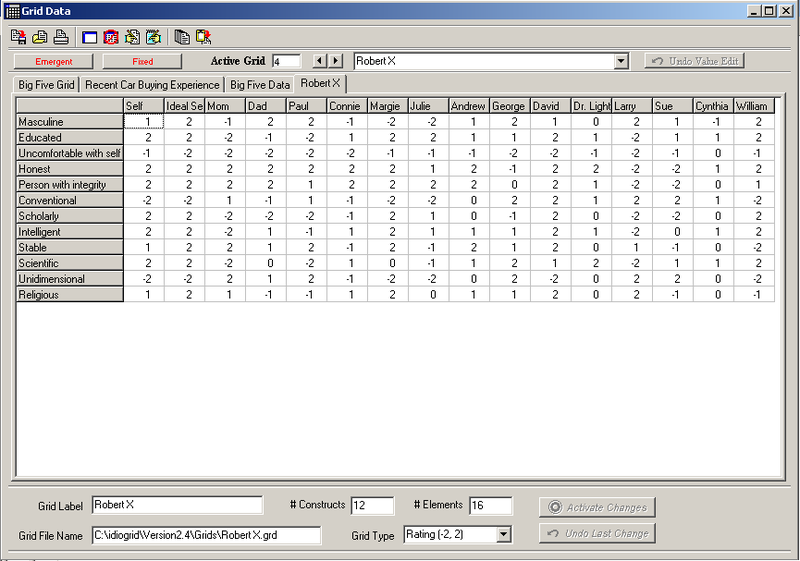 Large numbers of grids (i.e., completed sets of ratings) can be stored and manipulated in Idiogrid. These grids can be edited, saved, retrieved, printed, merged in a number of different ways, or transformed. Research or clinical notes can also be stored with each grid. The constructs can be unipolar or bipolar in nature and large grids (e.g., 500 x 500) can easily be handled by the software. Idiogrid also recognizes data that has been collected via rating, ranking, or binary choice procedures as well as data that has been transformed to a continuous scale. A large number of analyses commonly used in repertory grid and personality research are available in Idiogrid. Basic descriptive statistics, extremity analysis, bivariate statistics, principal components analysis (with 2-dimensional plots), and self-identity plots are a few of the analyses that can be requested. 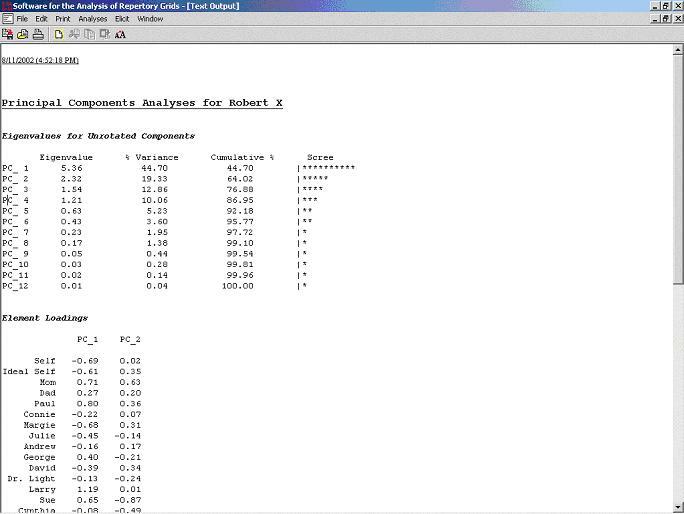 Click on the images to the right to view example output. 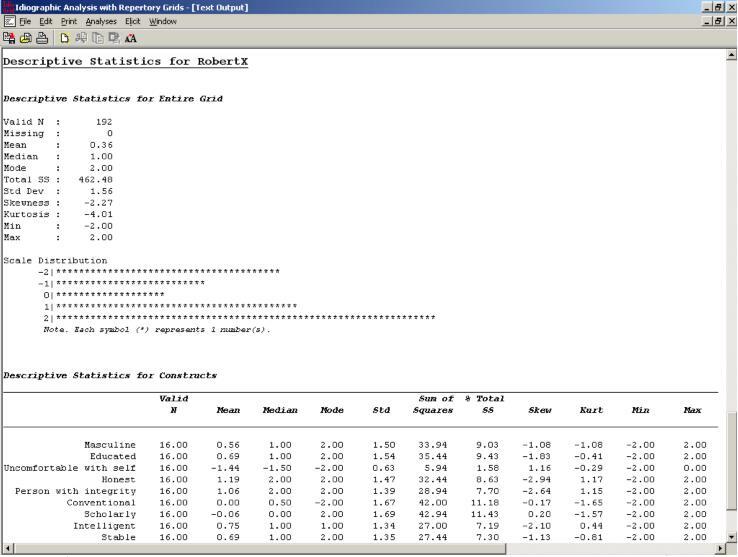 Idiogrid also exports grids directly to SPSS- or SAS-compatible files. Analyzing grids in these general statistical programs is hence just a single click away. Additional detailed information regarding Idiogrid's features and functions can be found by exploring the links on the main menu to the left.